Source of the post To be clear, as Midtskogen said "fundamental forces" in physics means gravity, electromagnetism, and nuclear forces, but I think what you're asking about are the things that can modify the expansion rate of the universe. Yes, I meant "fundamental" in the grammatical sense, not the scientific. A poor choice of words on my part, though shame on me because I knew what the FFs were! Are you stating here that at certain times future astronomy may open new cosmological frontiers, previously inaccessible? With the Big Rip scenario, certainly some things may not be possible to detect (at least directly), such as galaxies. But the fact that new energy densities could be discovered would be an exciting compensation for future scientists! Q&A with Watsisname. Or The Science Officer Files? Source of the post Are you stating here that at certain times future astronomy may open new cosmological frontiers, previously inaccessible? Yes, exactly. As the universe expands, substances that dilute more quickly (have larger equations of state "w") become weaker compared to substances that dilute less quickly (smaller values of w). Radiation (w=1/3) diluted away first, and now matter (w=0) is being diluted away compared to dark energy (w=-1). So the universe naturally goes through different eras, with different rates of change of expansion, dominated first by those substances with large w and evolving toward dominance by substances with small w.
If there is any substance with w less than -1, then its influence could be "hidden" from us now if it has a very small energy density today. But since it will dilute away slower than dark energy (rather, become denser while dark energy stays the same), eventually its influence will become visible to future astronomers. Let's see this vividly. Here I've run a simulation of the standard Lambda-CDM model, out to 100 billion years after the Big Bang, and then re-ran it with an additional type of mass-energy, which I give the label "X". I've set the density of "X" to be 1/1000th of the critical density today, and with an equation of state w=-1.5. Then I lay the plots of these two models on top of each other so you can directly see the comparison. The difference between the standard model and the model with the additional mass-energy "X" is too small to detect, until the universe is around 40 billion years old. The first sign of X's presence is that the value of the Hubble constant, (which had been essentially constant under the dominance of dark energy), starts increasing again. The distance to where the recession velocity equals the speed of light starts decreasing. The inevitable Big Rip is bearing its teeth. By about 50-60 billion years, we can see that the density of matter is decreasing faster than it would without X, because now the universe is expanding faster than it otherwise would. A little after 80 billion years, the density of X finally overtakes the dark energy. The universe is now dominated by it. Shortly after 100 billion years, it ends in the Big Rip. Source of the post With the Big Rip scenario, certainly some things may not be possible to detect (at least directly), such as galaxies. Yes, very good point! That far in the future, distant galaxies will be even more redshifted and extremely difficult (though perhaps not impossible) to detect. But there should still be galaxies bound within clusters, so the future observers in this scenario would not be completely isolated. As the Big Rip approaches, they will see its effects as their local galaxy cluster is torn apart. I do enjoy those graph-simulations for things like this. They are quite useful. Keep 'em coming if at all possible. Are there any other emergent phenomena that you can think of that might arise when the Big Rip really shows its teeth? I have read countless papers and books about this sort of thing, but what are some of the most interesting and newer hypothetical effects that you are aware of, that we didn't cover here on the forum so-far. I have started a new thread dedicated to Understanding Cosmology! I will leave all our previous posts on this subject here (trying to merge them became an ugly affair), but I recommend further discussion to continue over there. It is structured similarly to FFT's Solar System Dynamics thread, and I will also be occasionally updating it with detailed posts on particular topics. Watsisname, in your professional opinion, what do you make of Antony Garrett Lisi's "Exceptionally Simple Theory of Everything"? I know it is quite a lot to dig through, but I'm curious what you might think of it. I realize it sounds rather campy, and for those of you on the forum who don't have time to read through the articles, a summary of the theory is thus: as the name suggests, the theory tries to wed the divide between quantum mechanics and general relativity. It is a tad esoteric, and involves some 'sacred geometry-type' ideas. At its core, it hypothesizes that all particles are 3D representations of higher dimensional particles, all the way up to 8D particles. The above structure is a 2D representation of this made my mapping the qualities of these particles mathematically, called a E8 Lie Group shape. It is part of the so-called 'quantum gravity' camp of theoretical physics. Source of the postWatsisname, in your professional opinion, what do you make of E8 Theory? 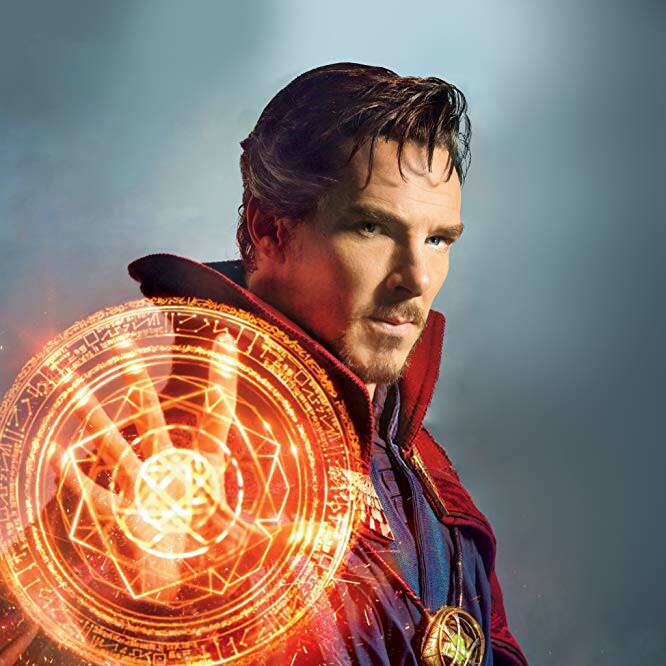 I think it looks pretty, in about the same way that Doctor Strange's mystic shield looks pretty. Granted, the former has a deep mathematical basis, while the latter probably did not. But that doesn't mean it will be a productive path for extending our knowledge of fundamental physics. I don't think anyone knows if it's the right path. What matters is if it is consistent with observations and successfully predicts something new that other models did not. There are many theoretical approaches these days, each with variations in motivation, utilizing different numbers of dimensions and so forth. And there are a lot of very smart minds working on them, so hopefully sooner or later at least one of them will have a breakthrough. I look forward to when they can connect with experimentalists and make practical testable predictions. That was an enlightening analysis. 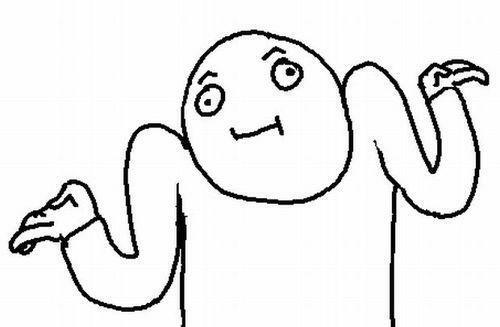 To divert the discussion, I have two sets of questions. 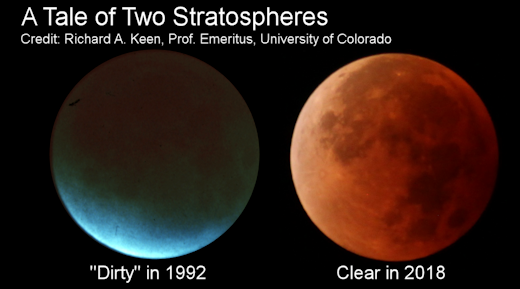 One about the color of planetary atmospheres and one about eclipses, but they are related. Now when the Earth eclipses the Moon, is it still visible because of scattering of light in the Earth's atmosphere, refraction, or both? 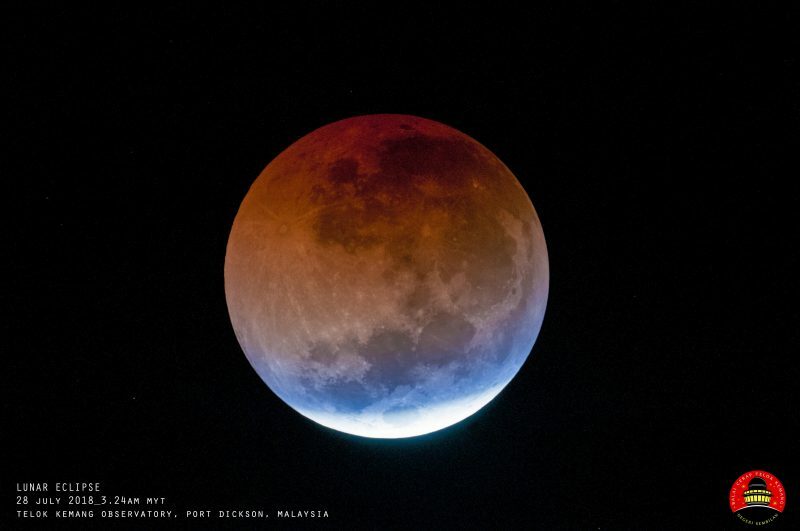 How does atmospheric composition impact lunar eclipse colors? This is why I asked about the color of pure O3 atmosphere. I've read that the edge of the Earth's shadow on the Moon during an eclipse is blue, because ozone in the air blocks red light and allows blue to pass. Having thought about it, I think atmosphere of pure ozone or ozone majority would cause the Moon to be blue during an eclipse. Contrary to this situation, I think there would be no blue edge if there was not any ozone in the air. Volcanoes, how can minute amount (compared to the bulk of the Earth's atmosphere) of volcanic material cause the Moon to almost disappear during an eclipse? What happens to all the sunlight? What about lunar eclipses elsewhere in the Solar system? I know the Hubble telescope observed Galilean moons while they were eclipsed by Jupiter. Jupiter is monstrous and has a much larger apparent diameter than the Sun when observed from any Galilean moon. Is the center of Jupiter's shadow much darker than in the case of Earth? What about the color of the eclipsed Galilean moons? What about the color and brightness of any moon in the Solar system? Observable from the parent planet or other moons? With or without telescopes? Dust: The Raleigh scattering only occurs with particles of a small size, and so does not apply to dust particles. With dust, the Mie Theory must be used instead, with broadly similar details. It dictates that the larger the dust particles, the more light is scattered, and thus the more grey the sky becomes at lower altitudes. Smaller dust particles scatter more blue light (as we see on Earth), whereas larger particles scatter more red light (like we see on Mars). Even more complications arise from this when we realize that the color of certain particles tend to absorb their inherent color, so red dust absorbs and scatters more red wave-lengths. The last component is of course the gas content of our atmosphere: nitrogen (78%), and oxygen (21%). Argon gas and water (in the form of vapor, droplets and ice crystals) are also present. These operate on Rayleigh scattering, as described above, with modifications from the Mie theory in regards to the pressure and temperature of the gasses. Oxygen scatters blue light very effectively since it's molecules are smaller. As you can see here, the shorter end of the visible spectrum (red) is closer in size to oxygen and nitrogen atoms, they interact more and are scattered to a higher degree. If only the shortest visible light was scattered, the sky would look more violet than blue. The rest of the colors would be green, yellow, orange, and red in decreasing intensity. I believe that answers your question about an eclipse viewed from within a pure O2 atmosphere. You mentioned sulfur, and this is a good example for the scattering in action. At 1 atm pressure, blue light is cut to below human eye visibility in less than half a meter, and the red is gone in fifty meters. 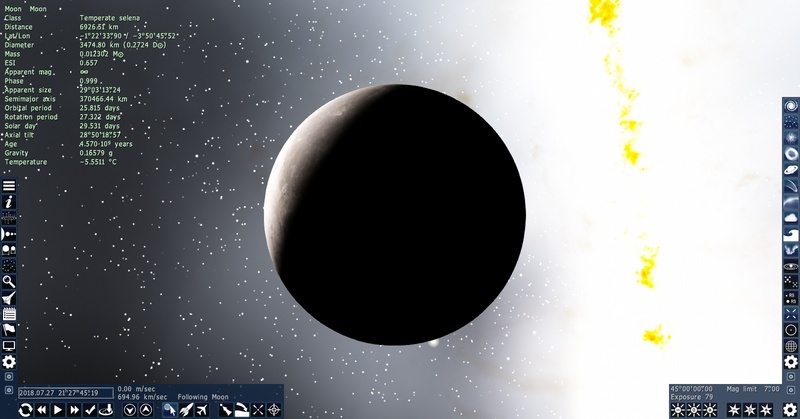 Hence planets with a predominantly sulfuric atmosphere would have a dim murky yellow sky. With chlorine gas, obviously green light is allowed more then any other color. Source of the post Volcanoes, how can minute amount (compared to the bulk of the Earth's atmosphere) of volcanic material cause the Moon to almost disappear during an eclipse? What happens to all the sunlight? This is caused by the Mie theory at work, by the dust and ash particles absorbing visible wave-lengths. Source of the post What about lunar eclipses elsewhere in the Solar system? I know the Hubble telescope observed Galilean moons while they were eclipsed by Jupiter. Jupiter is monstrous and has a much larger apparent diameter than the Sun when observed from any Galilean moon. Is the center of Jupiter's shadow much darker than in the case of Earth? What about the color of the eclipsed Galilean moons? I would use Space Engine for that An'shur! It is uniquely suited to such hypothetical. Source of the post You mentioned sulfur, and this is a good example for the scattering in action. At 1 atm pressure, blue light is cut to below human eye visibility in less than half a meter, and the red is gone in fifty meters. Hence planets with a predominantly sulfuric atmosphere would have a dim murky yellow sky. With chlorine gas, obviously green light is allowed more then any other color. I do not think I understand. That does not look like Rayleigh scattering which applies for small molecules like oxygen and nitrogen.. Is the sky color different for sulfur and chlorine because they are bigger molecules? Is the scattering graph itself different for these gases? Do they actually absorb all light except yellow, resp. green because of some other kind of interaction between the molecules and light? If I comprehend the idea of Rayleigh scattering well, then the scattered light does not drop in intensity, it just gets distributed in all directions. Source of the post Now when the Earth eclipses the Moon, is it still visible because of scattering of light in the Earth's atmosphere, refraction, or both? 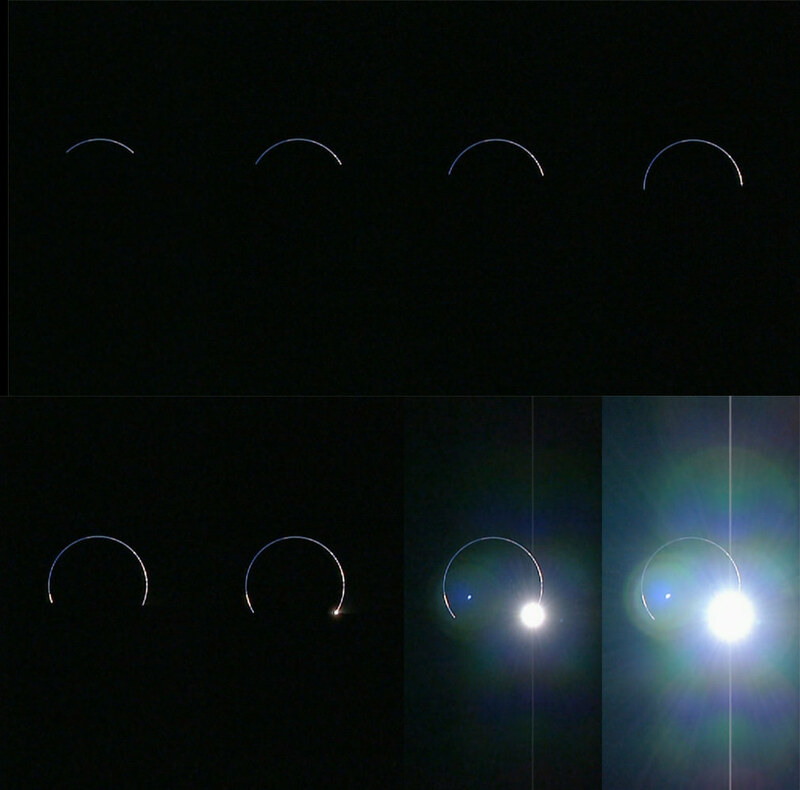 A sequence taken from the Kaguya spacecraft (2009). The Moon's surface is roughly horizontal, and the Earth, which is eclipsing the Sun, is rising up from behind the horizon. The ring of sunlight around the Earth is irregular, with brighter and darker spots, depending on the presence of clouds or particles in the atmosphere that may block the light rays from being refracted around. (Aside from the overwhelmingly bright spot that appears in the last 2 frames from Kaguya, which is a portion of the Sun's disk that is not behind Earth and not as affected by atmosphere). In the Kaguya image we can also see differences in color -- some parts of the ring are bluish while others are brighter and redder. That's where Stellarator's explanation of scattering comes in. The blue is from light that has been scattered off molecules in the atmosphere to reach the viewer, just like the mid-day blue sky we see on Earth, while the red is light that has been refracted around the Earth and reached the viewer directly. It is redder because bluer wavelengths have been scattered out of the path, just as we see the Sun and Moon turn redder when they are near the horizon. So during a lunar eclipse, there is light that reaches the Moon both by refraction and by scattering. The refracted light tends to be stronger (there is more of it) which is why the umbral shadow of the Moon is mostly red. 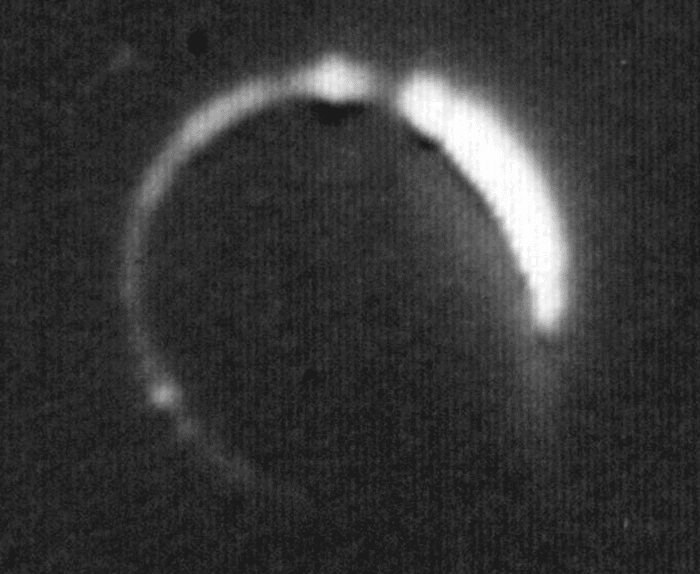 As a perhaps interesting aside, the images of the ring of sunlight bent around the Earth during a lunar eclipse reminds me of another phenomenon that can sometimes happen in optics. Light has wave-like characteristics, and if we pass a beam of light around a very smooth object it can be refracted around it, again being made visible to an observer for which the light source should be geometrically blocked. The physics is rather different, but the visual effect is very similar. Source of the post Is the sky color different for sulfur and chlorine because they are bigger molecules? Is the scattering graph itself different for these gases? Do they actually absorb all light except yellow, resp. green because of some other kind of interaction between the molecules and light? Yes, exactly. If we were to look at our tried and true Periodic Table, you would see that such elements like Sulfur and Chlorine are quite a bit atomically heavier then Oxygen (well, relatively). Source of the post You mentioned sulfur, and this is a good example for the scattering in action. Here I was describing the Mie scattering due to S being too heavy for Rayleigh Scattering to handle. S and similar elements in gaseous states absorb most light wave lengths VERY well. Blue, red and even a bit of green light is completely absorbed by Sulfur and Sulfur Dioxide. Add the affects of pressure, temperature and additional dust and/ or a different star as the light source, and you'll get a variety of dim, smoggy atmospheres. The example I gave was an example for examples sake in an Earth-like atmosphere, because atomic Sulfur cannot stably exist in a gas state at 1 atm, unless the atmospheric temperature is above 800 K. Unless S is continually replenished (usually by volcanic activity), it will react and bind to any other elements in the air. On Earth this is often Oxygen, and so Sulfur becomes Sulfur Dioxide in most cases. To see another example, look no further then Jupiter's moon Io (although all you would see from Io's ground would be a yellowish haze). Anyway, forgive me for not mentioning it was Mie scattering, not pure Rayleigh scattering. Do bear in mind when with SE atmospheres that color is not directly tied in with atmospheric composition and is more for looks then realism (as you have probably guessed). This is because the sky color parameters in SE are a old feature dating from way back and composition is a relatively new and still inaccurate feature. It is one of my greatest hopes that this will be perfected to realistic standards in later development. Already some progress is made in our up and coming v0990, where exotic atmosphere colors like purple and green will be rarer then more 'natural' ones, like grey or bluish white. Which SE version are you using? The 0980e patch has proper eclipse support, as described here. Also, play around with your exposure and light settings, the default values are not always the most realistic . Source of the post S and similar elements in gaseous states absorb most light wave lengths VERY well. Blue, red and even a bit of green light is completely absorbed by Sulfur and Sulfur Dioxide. Is that true? I thought sulfur dioxide is a colorless/transparent gas. Maybe you're thinking of aerosols? Mie and Rayleigh scattering have little to do with the mass of the scatterer, but rather its physical size compared to the wavelength of light. Atoms and most molecules are much smaller than the wavelengths of visible light (a few angstroms vs. 1000s of angstroms), so they are well in the Rayleigh regime. The Mie regime takes over when the size of the scatterer is within about a factor of 10 of the wavelength. If the atmosphere of Venus was completely cloud-free, would we even be able to see anything from the surface, like Sun, planets, and stars? Source of the post S and similar elements in gaseous states absorb most light wave lengths VERY well. Blue, red and even a bit of green light is completely absorbed by Sulfur and Sulfur Dioxide. Add the affects of pressure, temperature and additional dust and/ or a different star as the light source, and you'll get a variety of dim, smoggy atmospheres. About which my gut feeling tells me, that it would be similar to Venus. Source of the post Atoms and most molecules are much smaller than the wavelengths of visible light (a few angstroms vs. 1000s of angstroms), so they are well in the Rayleigh regime. The Mie regime takes over when the size of the scatterer is within about a factor of 10 of the wavelength. Yet chlorine is noticeably colored even in a bottle. Same goes for other halogens and gaseous sulfur, given Stellarator's reasoning. 0980, I've just downloaded the patch. Eclipses for Earth and Moon happen at the correct time. However, the umbra is as black as ever. I've only increased the exposure, haven't touched other parameters. Apparent magnitude is still infinite. Source of the post About which my gut feeling tells me, that it would be similar to Venus. Not technically true, because Venus contains no Sulfur in its atmosphere, just CO2(96.5%), some nitrogen (3.5%) and only a minute amount of SO2 (about 150 ppm), but in essence yes, that process occurs there, in conjunction with the intense heat and pressures found on that planet. "Mirage physics is also rather interesting. On Earth, mirages often result when there is a layer of warm air lying close to the ground. This air, being hotter, is less dense. It acts as a giant lens. Light coming from the sky near the horizon swoops down close to the ground and is refracted back up.2073 The mirage of water on an open highway is just a smeared-out image of blue sky. Dr. Conway Snyder at the Jet Propulsion Laboratory in Pasadena, California has performed a numerical simulation of the light-bending phenomenon at the Cytherian surface.2066 Let us imagine with him, for a moment, that we are aliens on the surface of Venus. Our eyeballs can see into the microwave region of the spectrum as well as the visible. What do we see? The horizon appears to be elevated upward, all around us, at 9.40 from the horizontal. (Only 5°, if visibility drops to 200 kilometers.) Since Venus rotates backwards, the sun rises in the west and sets in the east, creeping across the sky at an imperceptible eight minutes of arc per hour. We are standing at the equator at the time of the equinox, so Sol lies directly over head at noon, Cytherian daylight time. As the sun slowly falls toward the horizon, its shape begins to change. Its vertical dimension commences to shrink, while the horizontal component remains unchanged. At 6 PM Cytherian time, Sol should just be setting -- but it isn’t. Instead, it lies 10.4° up, but is squashed down to a quarter of its normal size. By 7 PM the squashing has become 250:1 compared with the horizontal dimension, and by 8 PM, 30,000:1. Sometime close to 12 PM, the tiny solar sliver suddenly increases in length dramatically, and at the stroke of midnight wraps itself around the horizon in a pencil-thin ring of light. The line then breaks in the east, the sun begins to reassemble itself in the west, and sunrise begins. If we are more than 3/8° away from the solar latitude, however, the ring of light will not appear. Instead, we see the compressed sun-image “crawl like a worm across the horizon during the night, from the point where it has set to the place where it is planning to rise.”2086"
Source of the post Yet chlorine is noticeably colored even in a bottle. The arrangement of electrons in a substance determines the frequencies of electromagnetic waves it will absorb. Thus Chlorine is green due to the fact it absorbs all colors, and only reflects green. Sulfur absorbs blue and red almost completely, and scatters green and yellow. Source of the post Apparent magnitude is still infinite. Did you try auto-exposure? Aside from that, I would admit that your question's answer is beyond the abilities of SE. Source of the post Yet chlorine is noticeably colored even in a bottle. Same goes for other halogens and gaseous sulfur, given Stellarator's reasoning. Just to clarify along with what Stellarator said, this is because of absorption of certain colors of light, not scattering. Absorption occurs when the energy of a photon can change the electron configuration (e.g. bumping an electron to a higher level), or by changing the molecule's rotational or vibrational energy. The energies of these transitions are quantized so the absorption requires specific matching photon energies (which is why we get narrow spectral lines for elements), but for molecules there can be many closely-spaced transitions which allows them to absorb a wider range of wavelengths. Atoms or molecules in a gas also have a distribution of speeds, so each one "sees" Doppler shifted light and so the gas can absorb a wider range of wavelengths as well.